Today at the Gym – There was some younger guy with an accent that seemed to specialize in doing really poor ab exercises. The first thing I saw him do was lay on the ab slant board which was set at a moderate decline angle. As he laid on the board he was raising and lowering an eight pound Sportfit ball (like a medicine ball with handles) up and down above his head. He did not raise off the board, he just moved the ball up and down. Then he grabbed one of those blow up balance balls, his was somewhere around 2 1/2 to 3 feet in diameter, a big one. He gets close enough to a wall that his legs are bent at a 90 degree angle. He then grabs the Sportfit ball again and holds it in front of him. 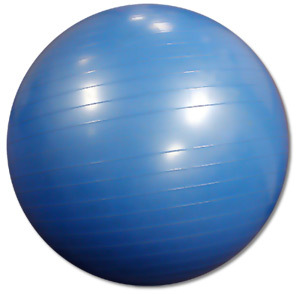 Then he starts bouncing up and down on the ball, at the top his back is perpendicular to the floor, at the bottom his back is 45 degrees to the floor. Each upward movement is not only assisted from bouncing his lower back off the balance ball but also using the Sportfit ball as a counterweight, further eliminating any use of the abs whatsoever. Oh well. I started off my exercise week with an untimed Ray’s Way. It was difficult but not torturous, meaning it’s time to up the reps.